About - RedCap Marketing Inc.
RedCap Marketing Inc is YOUR visitor destination marketing solution. High impact RedCap InfoStations immediately target visitors and tourists with high profile installations at Halifax’s major hotels and points of arrival including Halifax Stanfield International Airport, The Port of Halifax, Via Rail, and Nova Scotia Tourist Information Locations. REDCAP INFOTAGS are designed to promote your business using the convenient size of a standard business card and the unique aesthetic of a luggage tag. This innovative, eye catching tag is displayed on RedCap InfoStations where they are on display for potential customers to look over and pick up to remind them of the business location and perhaps a special offer. Red Cap tags fit in a pocket, a wallet or purse, unlike large conventional brochures. 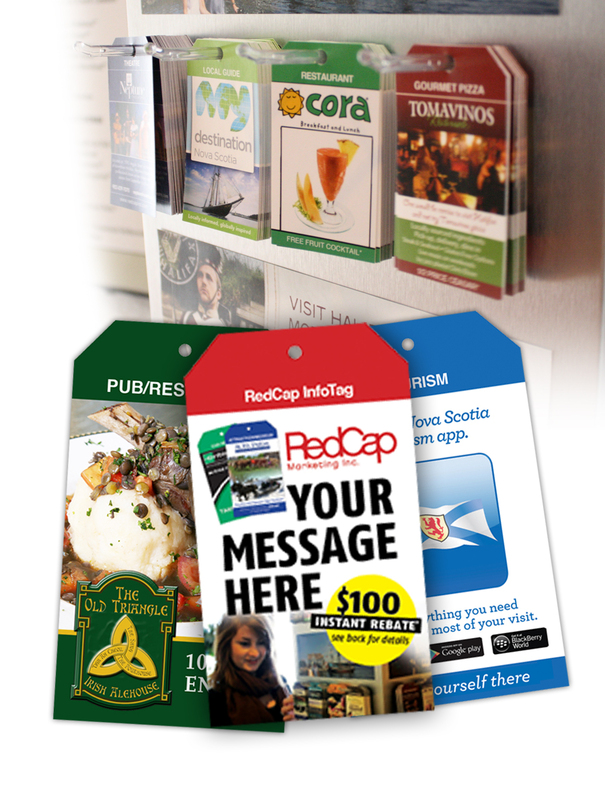 RedCap InfoTags eliminate the bulk, waste, and high cost of traditional brochures. RedCap Marketing looks after everything; from design, to printing, including distribution and refills at 32+ high traffic locations throughout Halifax and Dartmouth, NS. Inquire today about how your business can benefit from this cost effective, revolutionary marketing tool.